There appears to be some fresh confusion in the Trump administration, because shortly after a barrage of press reports - and statements by Larry Kudlow - suggested that the US and China were making good progress in their trade negotiations, moments ago Wilbur Ross appeared on CNBC and poured cold water on optimism, saying that the US and China remain "miles and miles" away from a trade resolution. We're miles and miles from getting a resolution and that shouldn't be too surprising. Trade is complicated. There are lots and lots of issues, not just how many soybeans and how much LNG but even more importantly, structural reforms that we really think are needed in the Chinese economy and then even more important than that enforcement mechanisms and penalties for failure to adhere to whatever we agree to. People shouldn't think the events of next week will be the solution to all of the issues between the united states and China. It's too complicate a topic, too many issues. That's different from saying we won't get to a deal. I think there's a fair chance we do get to a deal. 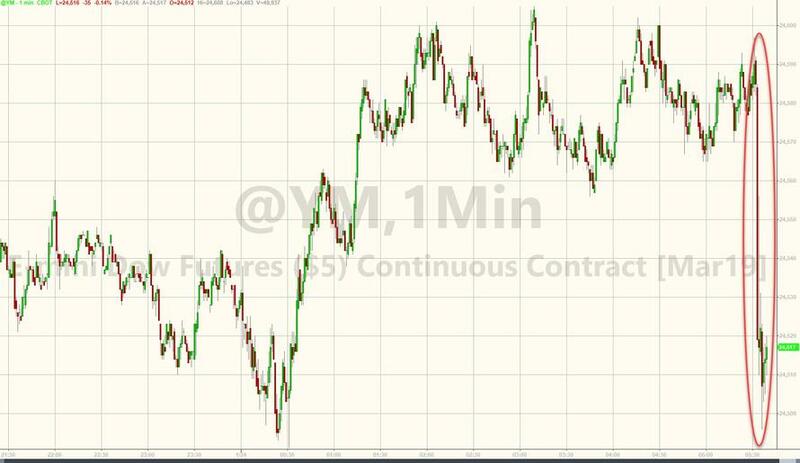 ... but it appears that he failed as the market response to this fresh dose of pessimism was instant, with the USDJPY slumping and US equity futures hit, and dropping to overnight session lows. And now we wait to see if Larry Kudlow will emerge on CNBC 30 minutes before the close to deny everything that Ross said just to provide a modest boost to markets.